Get off-the-beaten-track on an Urban Adventure in San Francisco! Discover the city's hidden gems and trek through the streets of San Francisco on your open-air game-viewing vehicle. This four-hour city expedition artfully combines visits to renowned attractions with journeys to alleys, murals, movie locations, and historical and architectural sites. All conducted with humor and a ton of fun! We offer an unforgettable 4-hour "Off the Beaten Track", highly personalized touring experience of San Francisco that is different from every other tour available. On your Adventure of San Francisco, you will explore many of San Francisco's historic landmarks. Marvel at Twin Peaks, snap a photo at the Golden Gate Bridge and drive through Golden Gate Park! Enjoy the city's stunning architecture as you travel into diverse neighborhoods of San Francisco. You will traverse the city in a custom, open-air game-viewing vehicle. You'll scout out scenes from movies like Hitchcock's Vertigo, find hidden artwork and learn secrets about which locals don't even know. 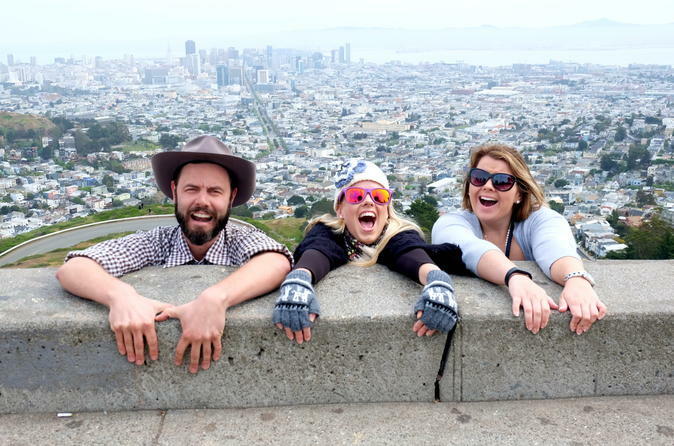 Your passionate San Francisco-based guides will share fun facts, wisdom and quirky stories that ensure a memorable visit. In addition, this comprehensive tour of the city includes stops to various events happening just that day! So come aboard, your Safari awaits.